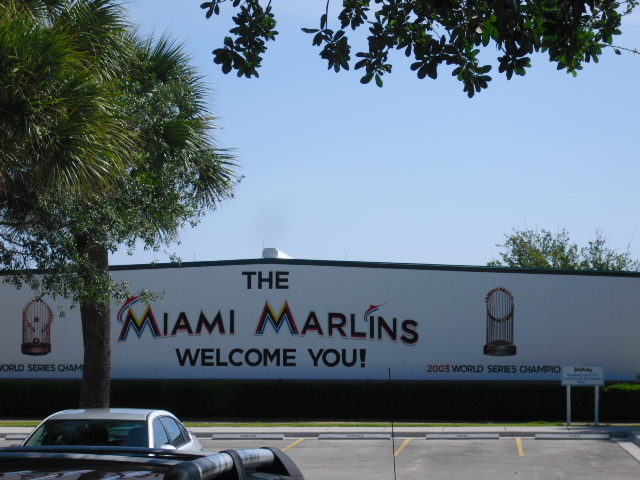 I started writing a scathing editorial of the Marlins’ front office, but I realized that Miami’s executives are so corrupt and unqualified that such a piece is redundant. Further, I don’t know what’s going on in the minds of owner Jeffrey Loria and his henchmen David Samson, Dan Jennings and Michael Hill. But I’ll pretend to. Yesterday that peanut gallery fired manager Mike Redmond, a long-time catcher for the Marlins, Twins and Indians who was well-respected by players and coaches around the league. In his place they put GM Dan Jennings, a man who has not worn baseball pants since he was signed by the Yankees as an undrafted pitcher in 1984. Loria, the eerily Vader-like tyrant of this franchise, is clearly not running a baseball team. He’s trying to run a profitable enterprise…into the ground. I don’t even know what kind of enterprise it is. Maybe a personal playground for his playmates, fulfilling Jennings’ lifelong dream of getting to wear a Major League Baaseball uniform. Possibly a front for smuggling exotic fish into the United States–those aquaria aren’t behind home plate for show. Maybe it’s the most exciting way he can employ himself while collecting and dealing art. One thing is for sure, though, he doesn’t care about the product on the field. Baseball is a great sport. It’s a relaxing, thinking man’s game that takes patience and hard work in order to achieve greatness. And that greatness comes in the form of succeeding just 30 percent of the time you pick up the bat. It’s not a game that flourishes in the face of politics or greedy businessmen, as our nation’s capital knows. And it’s not a game that generally spits out rewards overnight, although the Marlins do have two successful seasons in their history that may fool you into thinking otherwise. Loria continues to operate this franchise by taking one step forward and one and a half back. A process that has slowly moved the club nowhere and lost him respect everywhere. Previously, he had conned the city of Montreal and had its franchise relocated to Washington, D.C.. I’m quite happy with that, especially considering the Nationals’ success under the Lerner family. Then he came to Miami and fired Joe Girardi after a successful 2006 season in which: a) Girardi won Manager of the Year, b) Hanley Ramirez won Rookie of the Year, c) Dan Uggla hit 27 home runs as a rookie, and d) It finally looked like the Marlins would be contenders. Then he decided not to pay Miguel Cabrera, who later went on to win the Triple Crown in Detroit and is STILL one of the best hitters in the game. 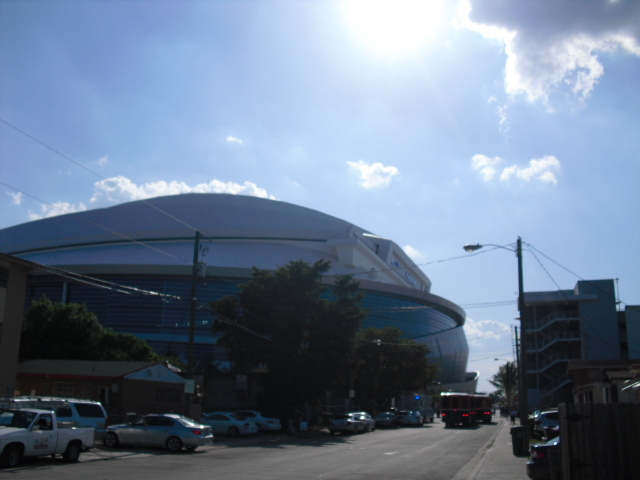 Then he conned the city of Miami into dumping tax payer dollars to finance his ballpark, which looks like a new-age spaceship sitting in the quaint neighborhood of Little Havana. He furnished the stadium with a spectacularly dreadful piece of art–which cost him more than any single one of his players in 2013 did–that doesn’t even have a name other than “home run sculpture,” inside of which he probably stores more of his stolen art and foreign fish. Finally, just this past offseason he convinced the most powerful hitter baseball has ever seen that he was finally committed to putting a winning product on the field, and locked up Giancarlo Stanton for this year and 12 additional seasons to the tune of $325 million–money that was magically hidden while he was trying to finance that stadium. Don’t be fooled, baseballers, these are just the highlights. 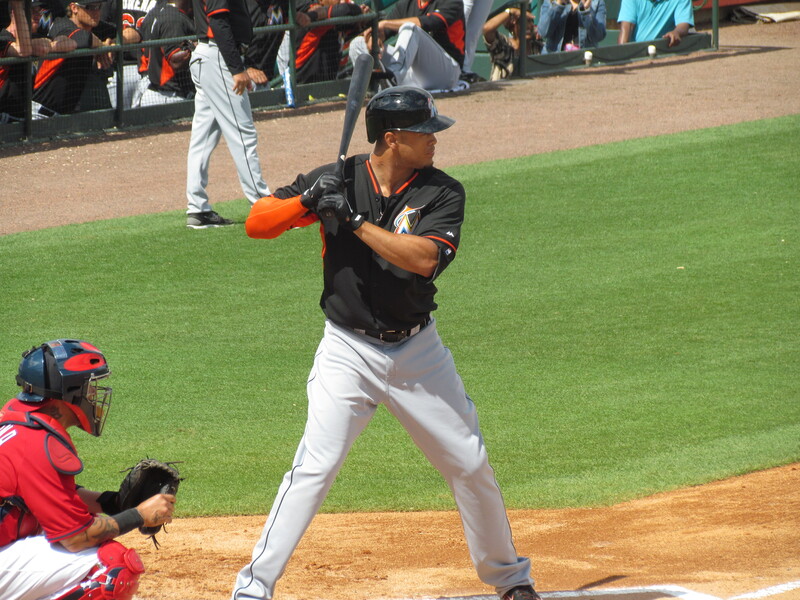 He signed Ozzie Guillen to a four-year contract before 2012, and Mike Redmond to a three-year extension after 2014. That means he will be paying THREE men for the job of one manager until the end of this season. Dan Jennings, the new manager, has not coached in professional baseball whatsoever, and in today’s press conference the Marlins executives spoke of Jennings as though he’d be a revolutionary piece to the dugout who will stick around for years to come. Just like Girardi. And Fredi Gonzalez. And Guillen. And Redmond. Loria could have hired Jeff Conine, the most beloved player of this franchise’s history, affectionately known as “Mister Marlin.” He could have called on 84 year-old Jack McKeon, who won the 2003 World Series as interim manager of the Marlins and is also a fan-favorite. He could have named Giancarlo Stanton player-manager, and the whole clubhouse would have shut up and listened to the most impressive hitter they’ve ever played alongside. He could have made Ichiro player-manager, which would have been simultaneously genius and hilarious. Ichiro, who speaks through an interpreter, would have had some legendary umpire arguments (that would have looked a lot like this, except with Japanese instead of French). Let’s go back to the spaceship, but now use it as a metaphor for the whole franchise. And I’ll call the ship Enterprise, since that what Jeffrey Loria is running. He’s the owner of the ship, and employs his manager as the captain, who heads the day-to-day operation of the ship and makes the ground-level decisions. But the captain must make do with what the owner of the ship has given him in terms of equipment and resources. He also must rely on the information his navigators provide. Well the navigators are Miami’s front office, and they’re all corrupt. They, along with the owner, want the ship to crash and burn, somehow profiting off the process. All along, though, they must appear to be operating a functional vessel. So whenever it looks like the captain has overcome the flawed equipment and directions and is righting the ship, the owner looks for a quick excuse to throw him overboard, into the abyss. For Girardi that excuse was something he said in a press conference. For Redmond, it was a sub-par 38- game start to a season in which the Marlins have operated in most part without their two best pitchers. Neither of which is a reason to fire anyone, but both of which are covers Loria has used to steer his ship away from success. This process has gone on long enough for Loria, as the Marlins are still an operable baseball club that wins games. So he has hijacked the ship’s bridge with right hand man Dan Jennings, who will do everything Loria tells him. 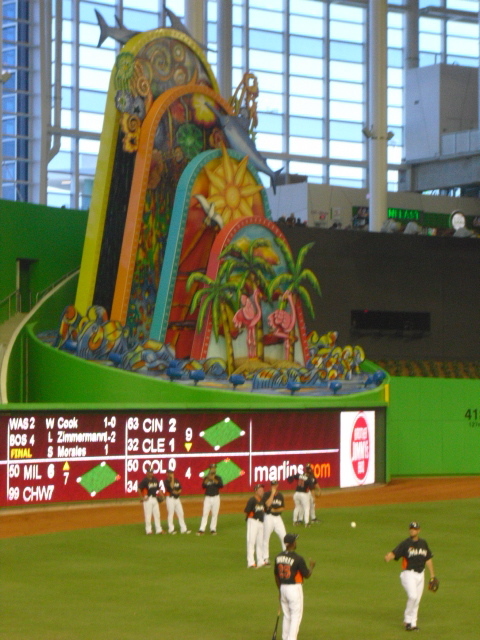 Pretty soon, David Samson is going to be hitting in the two-hole, and Loria himself will stand out in center field and dance as the home run sculpture. The problem is at the head. And that problem will exist until there’s a new man at the top. Patience is a vital virtue to practice in baseball. And when someone in charge makes greedy, impatient decisions at the slightest underperformance on the field, it creates a carcinogenic stigma. There’s no way to win in baseball when you’re afraid to lose. The best teams win because they’re having fun and enjoy winning. 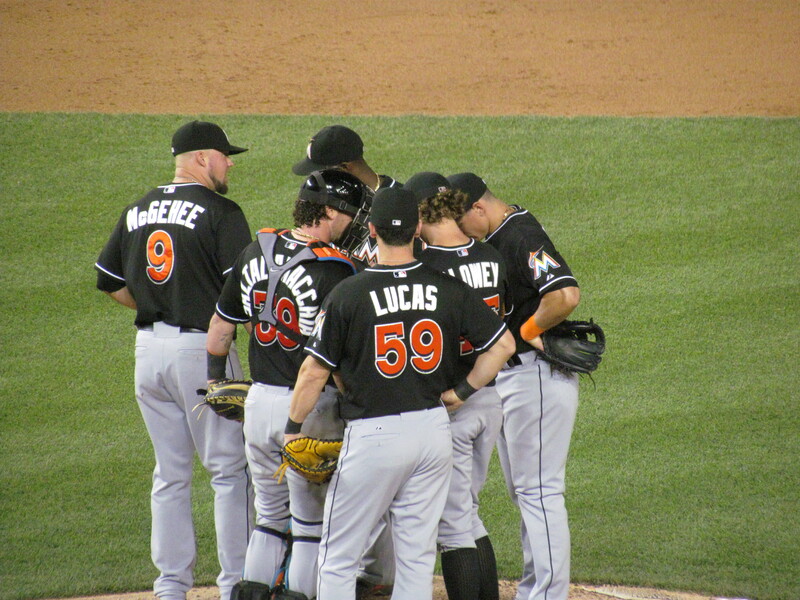 If the Marlins’ players and coaches show up to the ballpark in fear of losing, in fear of Loria, they’ll never win. Now that I’ve described Loria in terms of Star Wars AND Star Trek, I may turn to Tolkein’s world when he trades Giancarlo Stanton sometime in the next two years. Baseball is a wonderful sport, but it’s not for the greedy or impatient. And until the leaders of this team are ready to make an arduous climb that will be painful and will take time, baseball in Miami is going to be a wave of mediocrity, a sideshow to the circus in the front office. Now you know how Redskin fans feel about Snyder…we haven’t been good since he took over..in 1999! Thanks, Ben. That’s exactly what people have been telling me, about Snyder. And I think the Marlins have even more talent they put on the field than the Redskins, comparatively.